At Lifestyles in Nutrition, our virtual nutritionist can work with you on specific health concerns to form a personalized nutrition plan. This process can complement your medical provider’s program, and with your permission, our consultant can work closely with your doctor to establish a proactive plan. If you’re interested in scheduling a free 10 minute consultation, call Lifestyles in Nutrition at (303) 816-3713 or schedule a call on through our website. 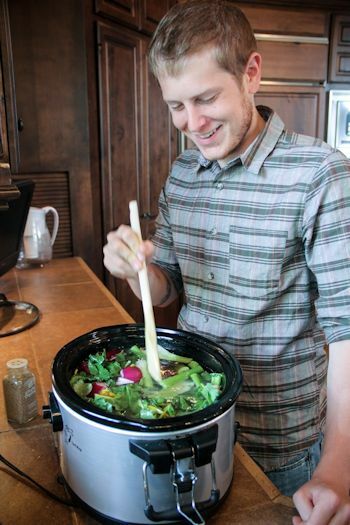 We’re introducing quick and easy nutrition services! If you have a question about nutrition, supplement choices, or herbal remedies, you can now call our Colorado holistic nutritionist for instant answers. Whether you’re curious about general health topics or any of the specialties listed above, Matthew Koontz can help. Additional research time may be needed, and you will never be billed for research. However, that time will be limited. Nutrition on Demand is excellent for those looking to make healthy changes but isn’t interested in signing up for a full intake and health plan. The flexibility of this program works best for individuals who are making changes in their lifestyle themselves and aren’t in need of regular guidance. Call Nutrition on Demand at (303) 816-3713 for answers to your health, nutrition, and herbalism questions. These Q&A sessions are billed at $1.50/minute, and payments are requested by credit card or transfers via PayPal or Venmo at the time of service. Topics that are too complex, specialized, or require medical cooperation may not be fully explored due to the nutritionist’s scope of practice limitations. If more research is necessary for an adequate answer, you may choose to try one-on-one consulting. In this case, your Nutrition on Demand charge will be deducted from your consulting cost. Book a Free 10 Minute Initial Phone Call! Health consults from our virtual nutritionist begin with an intake sessions that last about 1 ½ hours and follow-up sessions are typically 1 hour long, but can also be cut down to 30 minutes upon request. You can schedule sessions as often as you need to improve, but they are typically held every week. Those looking for personalized herbal remedies will also go through the consulting process. Herbal formulas are designed in the context of the client’s overall health and current medication plan. Botanical medicine, although supportive and gentle, can interact with medications and health conditions when used therapeutically. For those looking to an herbal protocol with no nutrition focus, the intake should only take about 1 hour. When signing up for a personalized nutrition plan, look through our add-ons for diet analysis, meal plans, food demos, and grocery store trips for even more nutritional assistance. All supplies will be provided and are already included in the price. If affordability is your concern, you can also look into signing up for our Share the Health program, which ranges from $15-$59 an hour. Each package deal is designed to address a common client health path and can be excellent investments in your health. Check them out below and see if there’s a package that fits your needs. Principle Nutrition ($339) – For those committed to making new changes for their health. This is the standard starting package to kickstart your health advancement! Four follow-up sessions will allow for three weeks of health goals and a final session to re-evaluate your health concerns and gauge your improvements! Topics Include: any of the specialties listed above, Eating for Health basics, nutritional heroes/bandits, evaluating foods for their nutritional quality, client’s unique health barriers, emotional level of eating, most effective changes for client, easiest initial changes for client, and more. 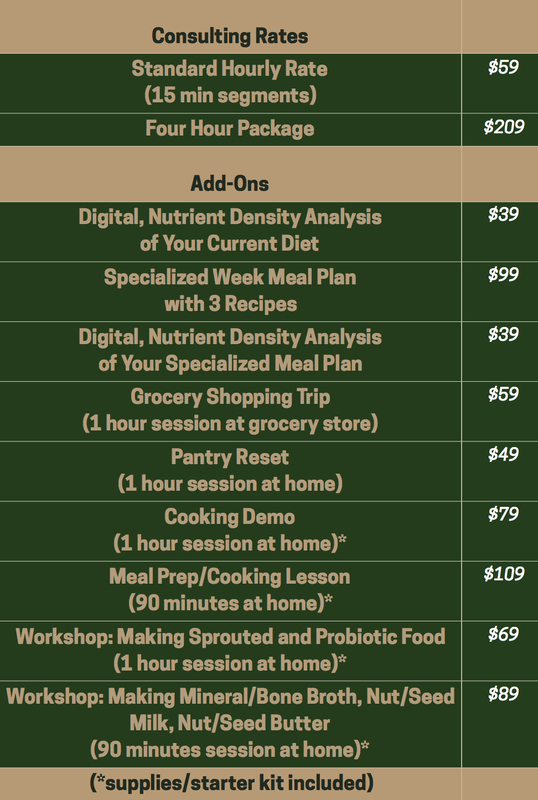 Diet Fortification ($399) – For those who need to see the numerical data about their diet. Curious how your diet is supporting you on a nutrient level? This package is fantastic for those who need to see the numbers showing the nutritional difference between their diet and a more supportive diet. Additionally, the meal plan helps guide you through a week of healthy eating and comes with recipes that help with healthy cooking. Herbal Plan ($199+) – For those who exclusively want an herbal consultation. If you’re looking for an herbal consult only, this would be ideal for you. Whether you want to address an acute health crisis (fever, cough, colds/flu, sore throat, infections) or more long-term issues (insomnia, pain, digestion issues, mood imbalances), we can find an herbal formula to address the issue or support complementary care. Three follow-ups will allow for a dispensing session and two follow-ups. During the follow-ups, we re-evaluate and tweak the formula and talk about a protocol to use in the future if the issue is reoccurring or a protocol to use long-term to prevent or address the issue on a deeper level. The herbs themselves are not included in the price because of the variability of herbal plans. Assume $20 minimum for herbs and $45 average. Topics Include: cold/flu and symptoms, lung conditions, intestinal issues, skin disturbances, poor digestion and symptoms, insomnia, anxiety/depression, chronic/acute pain, liver support, kidney support, immune system support, wounds, cardiovascular system, and more. Contact me today to ask about Health Consulting or to schedule a session! Call (303)816-3713 or email MKoontz@LifestylesInNutrition.com. Additionally, talks or classes on Holistic Health, Nutrition, and Home Remedies are available by request. My expertise lies in cardiovascular disease, diabetes, gastrointestinal conditions, and men’s health topics. Other topics include all the conditions under the Therapeutic Plan as well as estrogen dominance/hormone imbalance, liver dysfunction, sleep issues, pain, stress, and many others. Pricing is negotiable so call (303)816-3713 or email MKoontz@LifestylesInNutrition.com to provide more information.